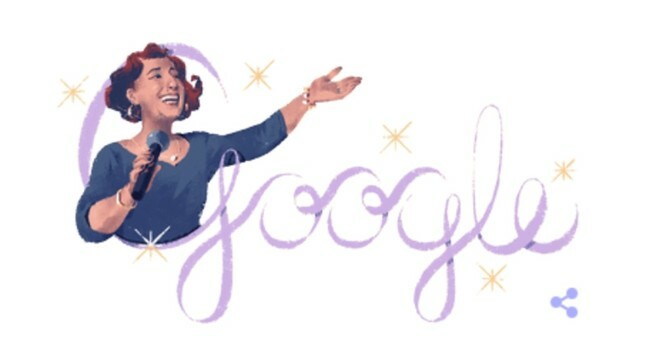 Google on Monday celebrated the 100th birthday of late Turkish singer and songwriter Müzeyyen Senar with a special doodle. Known as "Diva of the Republic," Senar was one of the most powerful voices of Turkish classical music in the 20th century. She began her career singing at age 14 for founder of the Republic, Mustafa Kemal Atatürk. Atatürk, who was known for his interest in Turkish traditional music, admired Senar's impressive voice, and she performed various times in his presence. Senar was born on July 15, 1918 in a village of Bursa, a western province in the Marmara region of Turkey. She moved to Istanbul at age 12, where a music teacher pushed her to attend the famous Üsküdar Musiki Cemiyeti - the Classical Music Association in Üsküdar. There, she began learning from the prominent musicians of the day such as Kemal Niyazi Seyhun Bey, a famous kemençe (fiddle) virtuoso, and Hayriye Hanım, who was an "udi" - a virtuoso oud player. Even as a teenager, Senar was among the elite musicians of traditional classical music of Istanbul, as her strong, deep voice impressed audiences wherever she sang. Senar recorded her first record in 1933 at the age of 15. She attended the initial recordings of Ankara Radio in 1938 and continued her radio performances until 1941. When her request to perform as a single singer not in a group of singers was accepted, Senar became the first "assolist" – the most prominent soloist of the night at modern music halls – of Turkish popular music history. She is said to have recorded more than 5,000 sides in her lifetime. She is best known for such songs as "Dalgalandım da Duruldum" (I was Blowing in the Past, Now I've Settled Down), "Benzemez Kimse Sana" (No One Like You), "Akşam Oldu Hüzünlendim Ben Yine" (It's Evening and Again I'm Sorrowful), "Ben Seni Unutmak için Sevmedim" (I Do Not Love Forgetting You), "Feraye," "Ormancı" (Forrester) and many others. Senar gave her final public concert at Istanbul's Bebek Gazino (music hall) in 1983. Afterward, Senar only performed privately on special occasions. She died on Feb. 8, 2015, at age 97. Many singers, actors and actresses attended at her funeral at Bebek Mosque and Zincirlikuyu Cemetery on Feb. 10.